Hey Folks, time for another "Guns that could enhance WW3" post and this one will be covering Pistols as I said I would from my last post. But, going to do things a little different this time as I wasn't overly happy with my last post. Maybe these changes will suit my desires a bit better and can use it as the standard layout & process from now on. Also down below at the bottom of this post I will be providing a link section to each of these Guns that could enhance WW3 posts that I make/made, which obviously means you will only see 1 link, and a bunch of place holders.. But, that is enough bla bla I'm sure nobody cares about, so lets get started in the usual fashion of - Before we can talk about what could be, we must start with what we currently have. Now, with this information in hand it's time to get to the real fun of the post with the new weapon suggestions. Much like my last post, I will be using the colors Green to indicate where a gun is better, Red where a gun is worse, Yellow where a gun is even or competitive. Calibers: 9x19mm, .357 SIG, .40 S&W, .45 ACP. - Now it seems like I'm recommending 2 guns in 1 here and in a technical sense I am. But, largely the M17 and M18 are not entirely all that different from each other. In the picture above you see the M17 on top and the M18 on the bottom. The only real difference is a slightly larger magazine, pistol barrel, and upper receiver. With WW3's customization options however, I don't think it would be a huge deal to be able to have both via customization options rather than making them two truly different guns. These guns are based off the SIG Sauer P320. - So, what sets the M17/M18 apart from the current guns? Well, nothing overly special beyond having a higher than average Ammo Capacity (Via the M17) or average Ammo capacity (via the M18). However, because WW3 is it's own setting, the Developers could choose to give the M17/M18 a higher caliber to make it slightly stronger than the other guns, but still overly keeping that same general performance feeling when using it (Meaning the gun doesn't have a large learning curve.) Overall the role I personally envision for the M17/M18 is to be more a core filler than anything super special. - Shooting what visually appears to be a scaled down 5.56x45mm caliber round. the FN Five-Seven's 5.7x28mm round is packaged to be able to penetrate a standard PAGST vest at 300 meters and a standard CRISAT (kevlar + titanium) vest at 100 meters. How much is truth vs. how much is marketing however, is still a bit in question. But, when it comes to body armor like what soldiers wear, typically the lighter & faster a bullet is moving results in more armor penetration. - So, if the FN Five-Seven was to be added to the game, what I personally envision for it is a Pistol that offers slightly less flat damage vs. Unarmored targets, but greater armor penetration than the current three guns have against Level III armor. This means the gun will also be a bit more friendly towards players that like to spam fire their Semi-Automatic weapons. - Widely used around the World, the USP is a lightweight pistol with the ability to pack a serious punch. Though it comes in many different calibers with various size magazines, weight, and etc, I would suggest the .45 Caliber to help further differ it from the current pistols. - If added to the game, the USP 45 would be a great gun for someone looking for something that packs a heavier punch, but doesn't stray exceedingly far from the other handguns in terms of how it generally performs. Overall the USP 45 would serve as a good entry level pistol for players seeking a higher skill curve weapon. Calibers: ,44 Magnum, .357 Magnum, .50 Action Express, and more. - Used by Polish & Portuguese Special Forces, the Desert Eagle is a widely recognized, and highly popular high caliber semi-automatic pistol. While the Desert Eagle does come in the impressive .50 AE, I think the .357 would be a far more reasonable caliber as it still packs a large punch, and doesn't shrink the magazine to the point that it's overly punishing for missed shots. - If added to the game, the Desert Eagle XIX should serve as one of the top skill dependent pistols to use. If a person is impatient, doesn't have good aim, or just generally doesn't use pistols, they may wish to drop back to the USP 45 or one of the other pistols till they feel comfortable to try the Desert Eagle again. But, if a person is patient, has good aim, and knows how to work around the weaknesses common in using pistols, they should be rewarded with satisfaction for each kill they score with this angry bird. But, what if someone wants something that can be powerful, but strays far from the familiar while still being powerful at close range? Info 2: Other websites I use didn't have much info. - While not used by any Military in the world (that I have found), the Taurus Judge can join the ranks of the MPA57DMG (DMG Nine-Milli as we know it in WW3) in being a fresh(er) face on the block. As a unique characteristic, the Taurus Judge (to my knowledge) is the only Pistol (or Revolver if you're that picky) that shoots a Shotgun style Ammunition. 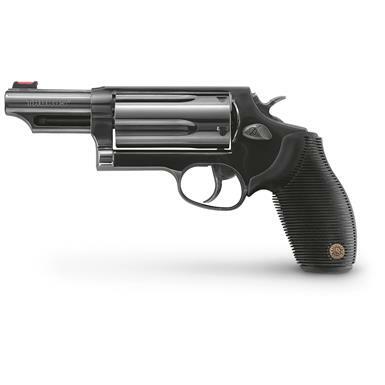 - If added to the game, the Taurus Judge should serve as a destructive, very close range pistol. While it would ideally lack body armor penetration, the fact that it's a compact shotgun of sorts means that it's stopping power should definitely be on the higher end when it comes to damage to unprotected parts of the body. Of the higher end pistols (aka these last three I'm recommending), this one should be the most forgiving for spam fire, but very unforgiving for hip fire shooting as each .410 Bore Shotshell has between 3-5 pellets a shot, where a standard 12-gauge shotgun shell packs 7 to 9 pellets a shot. - The RSh-12 is a prototype "Assault Revolver" that is able to deliver destructive force to both heavily armored soldiers and cover. If added to World War 3, the RSh-12 could serve as one of (if not the only) Pistol that is able to deliver notable damage to Level IV Steel Body Armor, deal damage to destructible surfaces, and offer higher than average bullet penetration on certain surfaces. However, such a destructive Pistol will need some considerable drawbacks for being such a lightweight powerhouse. - Now while the stats I proposed seem to imply that I want the gun to be overall garbage when compared to the others, such really isn't the case. The key features that this gun should bring with it is a very destructive punch, high armor penetration, high surface penetration, and longer-accurate reach when compared to the other Pistols (though obviously nothing akin to the Sniper Rifles, Battle Rifles, Assault Rifles, and etc.) Making this gun a weapon best suited for experienced players that are patient, not prone to spam firing their gun, and can remain calm even under a lot of pressure from an attacking team. Otherwise the only thing the gun will do is reward the player with regular visits to the respawn screen. Plus the gun is a Revolver and I know a lot of Players are wanting a Revolver of some sort in WW3. Ultimately with all these weapons, my proposed "balances" for them is best left in the hands of the Developers. Obviously I cannot test these numbers, thus trying to capture some sense of balance is rather challenging for me. So, don't consider my numbers as any sort of final recommendation, but a general idea of a direction I'd like to see the weapons go. With that mentioned, it's time to wrap this post up. Before bringing this post to an end, I just like to deliver some honorable mentions for Pistols that I think could still be good for the game, even if they didn't make my list. Glock 18 - A Machine Pistol able to fire Semi-Automatic and Fully Automatic. I just felt it didn't fit this list. CZ-75 - Another Pistol able to fire Semi and Fully Automatic. Again, I just felt it didn't fit this list. Mark 23 Mod 0 - Lost to the USP 45 only because the USP saw larger usage over the Mark 23 Mod 0. Viper JAWS - A Modern .45 Caliber pistol from the United States & Jordan. The USP had more information and was more widely used over this newer .45 Pistol. Beretta 92FS - An awesome 9mm Pistol that has seen vast usage across the world. QSZ-92 - A Semi-Automatic Pistol out of China that could serve as a middle ground between high end and low end caliber pistols. M1911 - The venerable M1911 has experienced a very long and successful career across the world and is a fan favorite for many. With all that out of the way, it's time to bring an end to this extra large post. Next "Guns that could enhance WW3" post I will be doing is going over Shotguns, those beautiful weapons that brings all the angry People to the text chat when getting killed by one. Thank you very much for reading and if you have any suggestions for Pistols/Revolvers that are not on the list in any shape or form (something not many People know about preferred) please share! Down below is also a hint for one of the new Shotguns I'm going to suggest, but I doubt anyone would be really surprised or unsure of what it is. Links/placeholders for my other "Guns that could enhance WW3" topics will be down below the picture. Great post, great effort, nice job! you cant have a desert eagle without 50. AE that can’t be done. so I think it would be awsome, plus it’s easy to name in game. Jokes aside (I do think the judge is good) I do want all these guns in game (most of them are pretty iconic) specially the revolver rush one and the ups-45 can’t wait to put a suppressor on that. also do you have some ice cream to go with that shot gun? Oh it can and has been done! In all seriousness though, the .50 AE could be done if the Devs want to go in that direction. I saw a post where someone had mentioned the Devs wanting to allow players to convert their weapons (not during gameplay I'm assuming) to various calibers. Like taking the Mk17 (SCAR-Heavy) and converting it down to the Mk16 (SCAR-Light) which fires the 5.56x45mm NATO round over the larger 7.62. Which ultimately could reflect an ammo count difference and other changes that would ultimately occur. But, how much of that is true vs. how much of that is wishful thinking is hard to say. The Judge and the Glock 18 really gave me a headache for that slot in the suggestion list. I knew there had to be some gun on the list that was truly different from the other guns in game, It couldn't be just another Semi-Automatic, or a Revolver shooting a slightly bigger or smaller caliber than the .357 Magnum of the Desert Eagle (hence why the Unica 6 didn't make the main list.) It needed to be something of a rogue, something just far enough outside of the principal rules of what makes a Handgun, but not so far out that it could be considered something else. So, what ultimately won it for the Judge came down to a few issues I had with the Glock 18. - Is it more of the same in some shape? - Does it have characteristic differences? Glock 18 fires Semi and Fully Automatic - So yes. The Judge is a Revolver shooting smaller shotgun shells - So yes. - Is it still considered a Handgun even with it's different characteristics? Glock 18 is considered a Machine Pistol even though it visually looks like a regular Handgun and Machine Pistols tend to get lobbed into the SMG category more than the Handgun category - Defeat for the Glock 18. The Judge is considered a Revolver even with it's ability to fire shotgun style shell rounds and there are no Revolvers in the game - Yes, Victory for the Judge. So those smaller details are ultimately what won it for The Judge to make the main list. Now of course someone can drop in the response of "It's cool, don't tell me how to have fun" which is ultimately fine for a wish list. But, ultimately a wish list is not my goal with these topics and the fun part of it (for me anyways) is that it keeps my bias opinions in check largely. Yeah it's extremely hard to avoid the Iconic to very iconic (bordering overly Iconic) guns and that isn't because they're not cool, or good at what they do. It's more of the fact that not too many countries are developing their own guns, let alone trying to radically evolve the currently formulas. So it's rare when we find guns like the Taurus Judge, CZ-75, or RSh-12 that are doing things just different enough that it sets them apart from all the others, double so when it comes to trying to find a spot for them in a game like this. So long as I don't lose reception because of a Man with a love of 6 inch blades and hatred for 'Fookin Laseh Sights' kicks the plan out from under me. Will always have love for the M1911 and if I had to let my bias take full control I would drop the USP 45 for it. usp lacks class and style and it is NOT an OG Browning design not like the M1911.